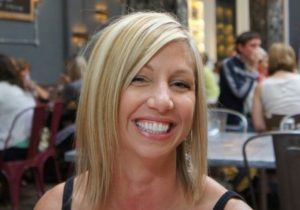 Kelly, RD September 8, 2017 cooking delivery meals dietitian Green Chef healthy cooking healthy meals nutrition nutrition advice registered dietitian weight lossLeave a Comment on On the Go! We always seem to be busy these days and there are times when the Green Chef meals get put off. That was the case this week. We only order them for two people on the weeks we have only Andrew. The flavors are very sophisticated and may not go over well with the older three kids. When I met Mike, they were 2, 4 and 8. Often parent meals were separate from kid’s meals and it has been a work in progress for me ever since. No judgement here. Even some of my dietitian friends have fallen into the habit of cooking separate meals. I admit, there have been times I have offered fruit and yogurt to replace the neglected meal provided. But, offering is the key. No members of the clean plate club here; one bite receives praise, even if the remaining portion gets dumped into the dog bowl. The key is to keep offering, over and over and over again. Andrew really has shown no taste for broccoli since we began solid foods at 6 months, except in Japanese dishes (sooooo wish I could mimic that sauce!!!). My long time dietitian friend and colleague told me she treats her 5 year old son like a dinosaur, feeding him “trees”. I tried it at a restaurant the other day and IT WORKED!!! Mike and I decided it might just be best for one of us to cook a meal for the kids and the other to cook the Green Chef for two. I decided to make chicken and rice with green beans for the kids in the Instant Pot since I had failed to plan ahead. Even an oven baked version would take too long starting as late as I did. 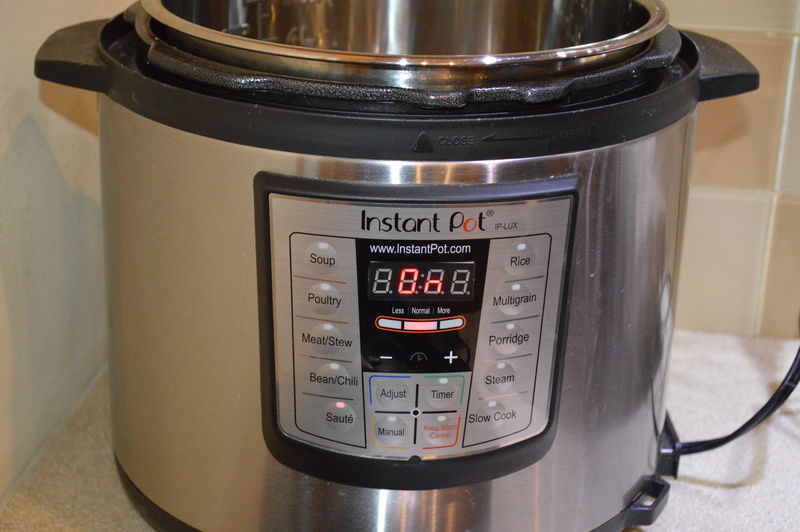 The Instant Pot is a great option for last minute meals! I just Googled an Instant Pot chicken and rice recipe and followed it exactly. It turned out well and the kids really liked it. 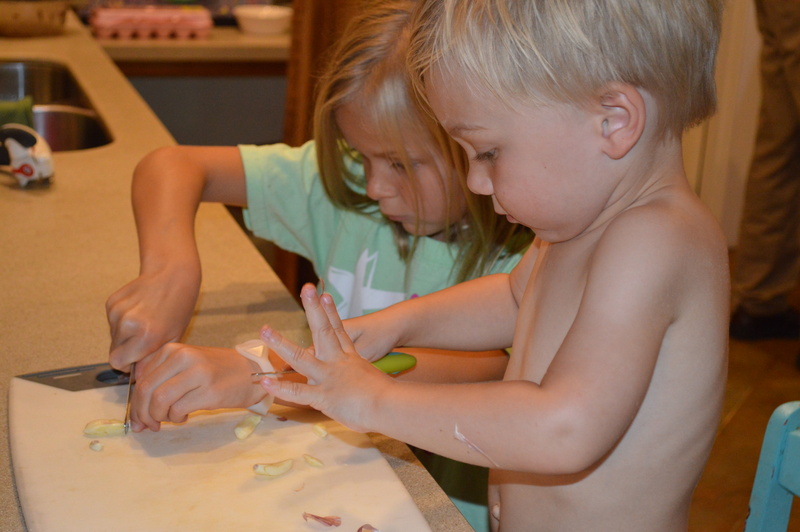 These two cuties chopped the garlic for me. Here’s the recipe: Instant Pot Chicken and Rice The Green Chef meal? Garbanzo Bean Fideos. What is a Fideo, you ask? I had to look it up myself. It’s a traditional Mexican dish of fried noodles served with sauce. We made sure to put a bit of the Green Chef on everyone’s plate. One kid said she liked it. One said she “kinda” liked it. One said he tried it but, probably didn’t. The little one ate a few bites. It worked out well. Everyone was happy and we didn’t have to waste a Green Chef meal which would be tragic. A product I can’t seem to do without? It gets the job done fast! If you feel overwhelmed by all the nutrition advice, calorie recommendations and diet trends, read these: Fact. Not Fad., Let’s Crunch Numbers!, Help Me To Help You!